Soda makers have become increasingly popular as it allows you to create your own favorite drinks right in the comfort of your own home. Giving you the ability to invent carbonated drinks by instantly turning tap water and other types of water into a unique sparkling drink. The idea of creating your own drink by adjusting the fizziness by using different amounts of carbon and flavor is best suited for those looking to be creative with their own sparkling drinks. There are many different types of soda makers which have their own features, and depending on exactly what you’re looking for you’re sure to find one for you. The hard-part is determining exactly what you want and finding the right product to make it all happen. SodaStream is one of the biggest names in the business, but there are others who are slowly emerging giving your own touch of class on sparkling water. The following review focuses on the Top 5 Soda Makers in 2018 while considering all you need to know. SodaStrea is the original manufacturer of soda makers and over the years they’ve made it possible to bring the fizz of sparkling water right to your kitchen. The SodaStream Source comes with everything you need which will have you inventing and customizing your own flavor drink with a whole lot of style. With over 40 flavors and specialized drinks to choose from or for those who feel a bit more inventive, try concocting up your own sparkling water. 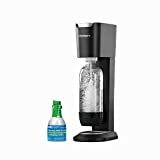 The SodaStream Source is a complete soda maker starter kit which includes which requires no batteries or electricity to power. Included in the box are more than 40 different types of drinks which include naturally flavored, diet, and regular. Complete with a comprehensive 2-year water, the Source is well-protected. The SodaStrea Fountain Jet is another all in one solution starter kit and comes in slightly less than the one above. Priced to sell at just under $75 with free shipping is a steal at this price considering everything in the box. 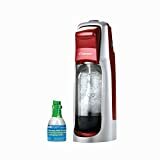 Included is the Jet Sparkling soda maker, 1 Liter BPA-free Reusable Carbonating Bottle, Mini CO2 Carbonator, Free 60-liter carbonator mail in rebate that can be redeemed at over 10,000 locations. Enjoy the #1 selling brand of soda makers with more than 40 flavors including regular, diet, and all-natural flavors with no high-fructose corn syrup and no aspartame. Just like the Source, the Fountain Jet doesn’t require batteries or electricity to operate. The black and silver SodaStream Genesis creates sparkling water, and takes less than 30 seconds. The Genesis is one of SodaStream’s newest arrivals and has quickly become a top-seller on Amazon.com This complete kit comes with more than 60 different varieties including diet, regular, and all-natural flavoring with no high-fructose corn syrup and no aspartame in any of the SodaStream flavors. Each bottle of 60 mix creates more than 33 cans of soda and with the ability to create different flavors and fizz levels you can literally create a different drink for everyday of the month. The Genesis does not require batteries to run and features a no-need cleanup system. If you’re looking for a better tasting and healthier form of soda, considering the Genesis by SodaStream is definitely a wise decision. The DrinkMate Carbonated Soda Maker is the only carbonated drink maker that allows someone to carbonate virtually anything they want. There are no limits to the DrinkMate soda maker which features a large 3oz. cylinder and has a patented Fizz Infuser which detaches and two release button that allow better control on CO2 release of. Users have stated the DrinMate is super easy to use, takes no time to create carbonated drinks, and is easy to clean. The smaller design when comparing it with other soda makers makes it easy to store and takes up much less counter space. Just like most others, no batteries or electricity is needed as it’s a self-powered appliance. 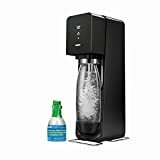 The SodaStream Power is the cream of the crop when it comes to features which explains the price which comes in more than the other soda makers in this review. Unlike most others, the Power must be plugged into a power source as it requires conventional electricity. The sophisticated and sleek design with metal accents of the Power makes it easy to blend with any modern home décor. The Power is a complete kit which comes with everything you need to start creating beautifully tasting soda and other beverages from water. Included are over 40 different flavors including diet, regular, and natural flavored SodaStream mix varieties with no high-fructose corn syrup and no aspartame. A quick snap lock-button insertion and touch button activation are some of what you’ll also find included. If you’re looking for more info or have something to contribute, feel free to reach out to us on Facebook or be sure to tell us all about it in the comment section below.